Bellevue Literary Press, 9781942658603, 208pp. The story behind this New York Times bestselling debut novel--the first independently published Pulitzer Prize winner since A Confederacy of Dunces received the award nearly thirty years before--is as extraordinary as the elegant prose within it. Inspired by his family's history, Paul Harding began writing Tinkers when his rock band broke up. Following numerous rejections from large publishers, Harding was about to shelve the manuscript when Bellevue Literary Press offered a contract. After being accepted by BLP, but before it was even published, the novel developed a following among independent booksellers from coast to coast. Readers and critics soon fell in love, and it went on to receive the Pulitzer Prize, prompting the New York Times to declare the novel's remarkable success "the most dramatic literary Cinderella story of recent memory." 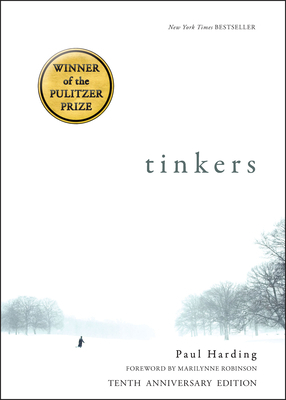 Paul Harding is the author of two novels about multiple generations of a New England family: Enon and the Pulitzer Prize-winning Tinkers. He teaches at Stony Brook Southampton. Paul Harding is the author of two novels about multiple generations of a New England family: Enon and the Pulitzer Prize-winning Tinkers. He teaches at Stony Brook Southampton.Marilynne Robinson is a Pulitzer Prize-winning novelist and essayist. Her recent books are Lila: A Novel and What Are We Doing Here? : Essays. She lives in Iowa City and is professor emerita at the Iowa Writers' Workshop.